The 2018 harvest commenced on August 16th with picking of the grapes destined for our sparkling wines (Chardonnay, Pinot Nero and Pinot Grigio). According to the first pickings, the vintage is a promising one: from the end of July and into August we did not experience torrid heat and the vines did not experience any hydric stress. The wide day-to-night temperature range of recent weeks has slowed down ripening, favouring the synthesis of both primary aromas and precursors of secondary aromas, as well as preserving very fresh acidity, ideal for producing Metodo Classico sparkling wines and for the white wines in general. To date the harvest is 7-8 days later compared to the 2017 harvest dates. 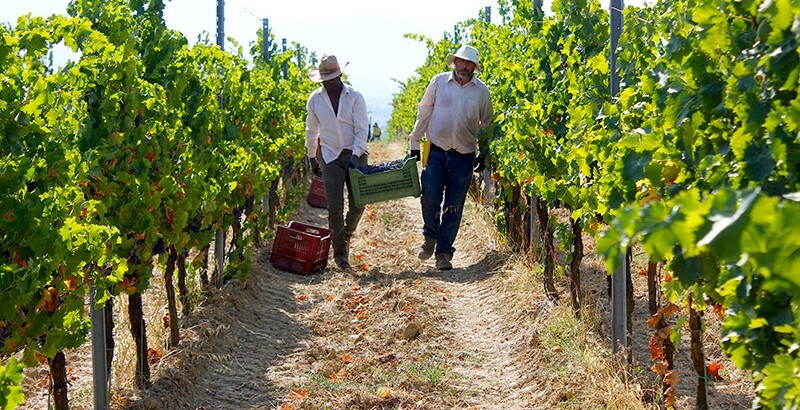 The grapes are currently in excellent conditions and healthy, also thanks to a good ventilation which contributes to protecting the vegetation from late-developing attacks of mildew. In this early part of September we are harvesting the Merlot grapes destined for carbonic maceration for Falò, while at the end of the week we will pick the Merlot grapes for L’U Rosso. In the meantime we are continuing to monitor ripening in the vineyards to determine exactly when to begin harvesting the Grechetto and Vermentino for our Torre di Giano, the next varietals to be picked, presumably next week, the second one of September.